Small is truly beautiful. A single email winged its way from the Dalai Lama’s office to my Google colleague Shailesh in India and then on to Vic in the U.S. and Marvin in Korea before landing finally in my inbox. It expressed an interest that the Office of the Dalai Lama had in the product I am working on—Google+—and it started me noodling some ideas on a piece of paper. One of them was to put together The Dalai Lama with Archbishop Desmond Tutu in a Google+ Hangout and allow thousands of people to view it live on the Internet. I told a few colleagues about this random and crazy idea and left it at that. Thirteen years ago, I wrote a list of goals for my life that included a desire to meet the Dalai Lama in person. Over the years, things started coming together. I walked into the back of a bookstore and saw a poster announcing that he was speaking nearby the following week. I then heard him speak several times—almost by chance—in places as far apart as Sydney and San Francisco, and most recently, in October 2010, at Stanford University. But as I returned to the Google office from that talk, it struck me that I had not done much about my goal to meet him in person and did not know where to start. Perhaps a good first step would be simply to ask someone? Zooming forward to October 5, 2011, the morning after my phone call from Jonathan in South Africa, I sat discussing a possible solution with Loren, the Product Manager for Google+ Hangouts, in our usual place under the Katta. Five hours later, Loren was on a 33-hour journey to South Africa. What was remarkable, I found out later, was that Loren had never before traveled outside the country. He got a passport just a few months earlier, thinking it may be a good idea to start traveling internationally. A dozen of us from Google in four different countries around the world swung into action—we had just 60 hours to make it happen. Note: the author works for Google, but the opinions expressed here are his own and not Google’s. 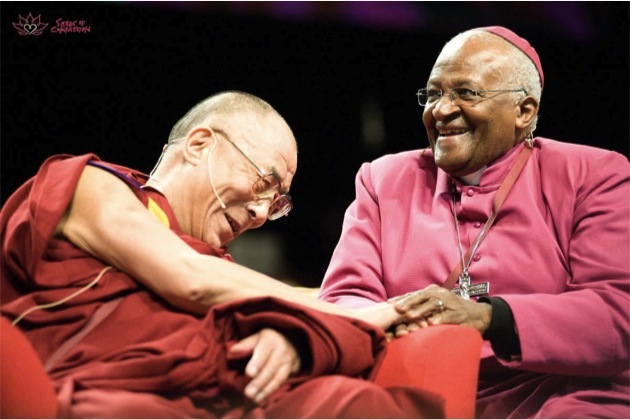 Highlights of the Dalai Lama-Archbishop Desmond Tutu Hangout can be watched here. Photos provided by Gopi Kallayil. A wonderfully moving story. What an honor to be part of such an experience, and now, I feel like I’ve received just a touch of that honor by your sharing this. Thank you. Gopi rocks. Always an inspiration. SO THIS IS WHAT YOU HAVE BEEN DOING LOREN! GOOD jOB! aND yES WE ARE ALL PROUD OF YOU! cAROL! Beautiful story! Definitely my biggest 2011 highlight! I’m glad Mr. Kallayil has had such a charmed life. I’m really happy that he can book a flight to India, and pay for it, on two week’s notice. I’m happy that he did not have to negotiate leave from his employer, to reschedule events previously planned with his son or daughter. I’m glad he did not have any commitments that he could not get out of, so that he could fly halfway around the world to achieve his personal (dare I say selfish) goal of meeting the Dalai Lama. International travel is not without costs. I wonder about the carbon emissions of his flight to India. Is the environmental cost less important than his (dare I say selfish) desire to meet the Dalai Lama? Where is the compassion for humanity when he’s belching greenhouse gases in a plane fueled by fossil fuel? Hooray for the passionate Googlers, who live their own little charmed existence without pain or suffering. I’m so glad. Thank you Gopi for sharing your journey. But most importantly, the lens which you view the world is quite extraordinary. You are an inspiration. Eleonora, il “simpaticissimo ed esuberante sarigtatio CAPO NR3” ti ha gi tra le sue simpatiche grifie: vive gi intensamente dentro di te e , talvolta, un amante dall’interno cresce e prende molto pi posto che dall’esterno. Se ce la fai fallo diventare piccolo (ma mi pare una missione piuttosto impossibile) altrimenti non hai altra possibilit di metterlo alla prova dei fatti e sperare che ti deluda.P.S. Non vi simpatico ed esuberante farfallone che non abbia alle spalle un “matrimonio naufragato da tempo”. Magari da simpatico qual avrebbe potuto essere un po’ pi originale. wonderful sharing, Gopi … when the call comes … we must respond … for the call may not come again … great knowing you and sharing all these experiences … Raghavas. E INTANTO IO ORA son alle prese col simpaticissimo ed eunebraste sagittario CAPO NR3 che ancora una volta,dopo5mesi,mi fa:TU VUOI “PERDERMI”MA NON CI RIUSCIRAI!! !oggi,per lavoro,eravamo in auto insieme poi al bar col cliente,poi di nuovo insieme gli facevo da autista stavolta per problemi col suo macchinone molto curioso,mi piace,mi diverte, solare al massimo,ma resta comunque sposato(seppur con matrimonio naufragato da tempo):in 1000modi diversi,gli ho detto che non giusto,non sono il tipo ma lui nulla:non molla la presa! !C’AGGIA FA,MO????aiutooooooooooooooooooo!!! These precious moments are what we live for: peace and happiness. Keep imaging and allowing your creative horses to run, for there is no doubt a single idea can change the world. Indeed, such changes were waiting to be unfettered.